Okay! 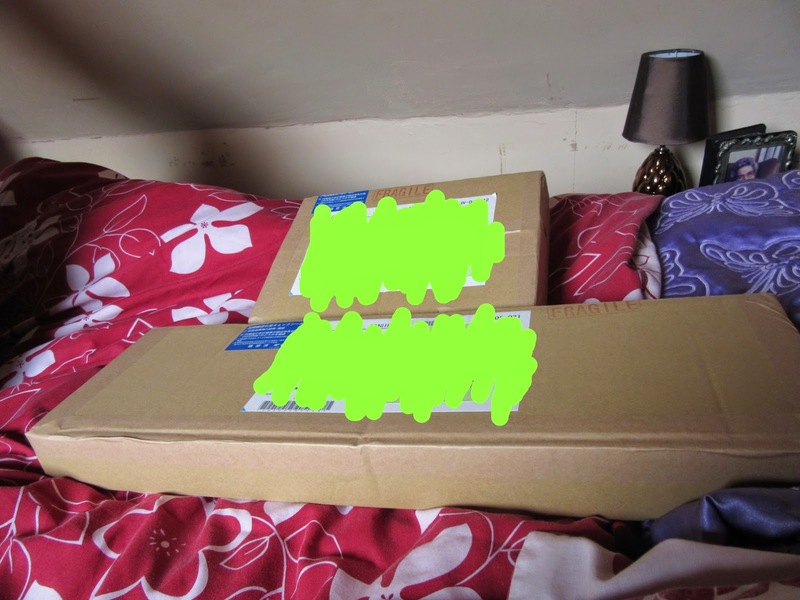 Musume Time: ☆~Haulage Time~☆ Idol Goods GET!!! ☆~Haulage Time~☆ Idol Goods GET!!! I typically don't do Haul-related posts here, I never seem to find the time to post the pictures or talk about what I have hauled, but once in a while, it is nice to want to show what Idol products I am hauling, and who I am liking currently, especially if the Idol(s) in question aren't always linked to the Hello! Project boat I row most of the time. And, because my recent haul is something that I was really excited to get the second I returned home for a visit, I thought that I would do a Haulage post and show the goods that I have recently bought! In truth, though, this is also a tribute post to the recently deactivated Konno's Story; Konno was pretty active in his Haul posts, showing the CD's he bought and the groups that he supported, and whilst I will never do my posts as he did is, I wanted to do this in memory of his blog, because I really loved it. I miss Konno and what he provided to the Idol community, and do hope that he one day returns. So, if you read this Konno, this is for you. You are dearly missed here. Anyways, without furthe ado, we shall get into the Haulage! Time to look at some Idol GET!!! 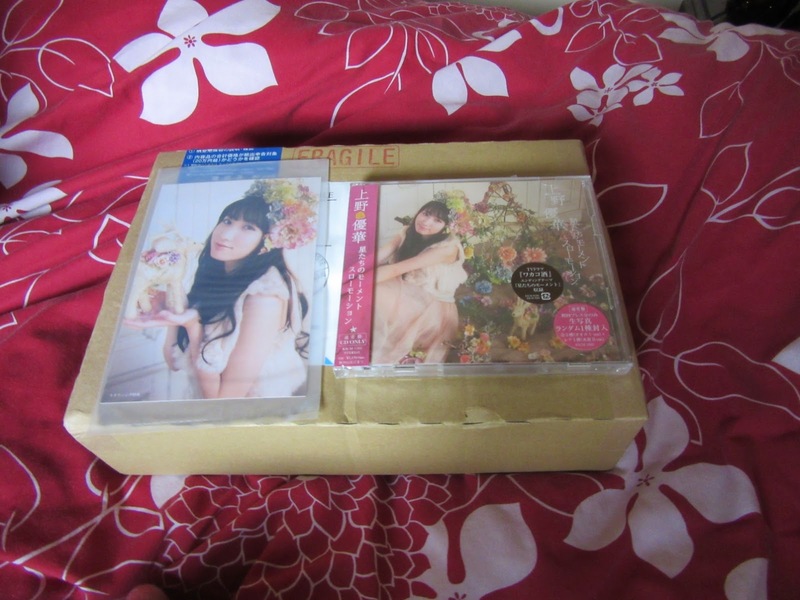 Okay, so upon returning home, I was met with these two beauties; CDJapan packages! MUAHAHAHA! 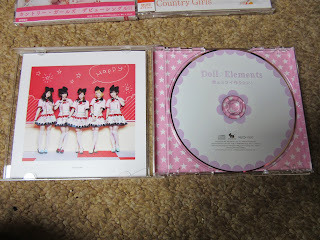 A majority of my CD's come from CDJapan, though I do sometimes buy through Yahoo Japan Auctions via a third-party person. I have yet to attempt HMV Japan or YesAsia, and any others that come to mind, but so far CDJapan have done well for the past, what, four years since I've used them? Okay, time to shut up and open: THE FIRST BOX!!! I actually opened the longest package first, because this was the one I had anticipated the most since ordering it; Hoshitoachi no Moment / Slow Motion, by Yuuka Ueno. 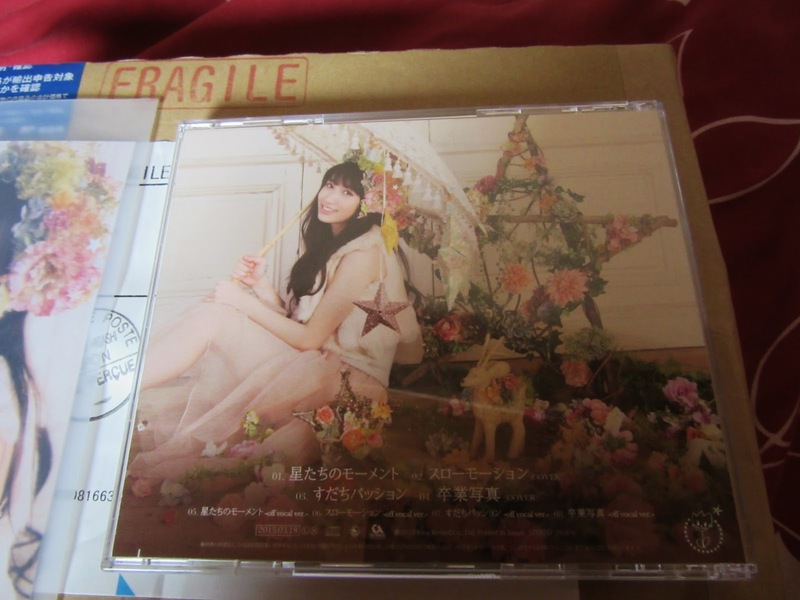 This is my first single purchase from one of my favourite soloists, and hopefully not the last. 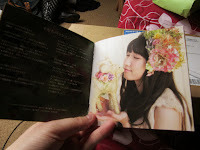 This single is her fifth release overall, and has a really pretty lead song in the form of Hoshitachi no Moment. The PV's amazing, too, and follows a date-like format. Seriously, this girls an amazing singer, and I adore her. I've followed her since her debut, and continue to be floored by her talent. Because I was able to grab one of the last two first press editions, I was able to bag a CDJapan exclusive photo, B3 sized poster (which has not been photographed, as it has yet to be opened) and a first press photo along with the CD itself! 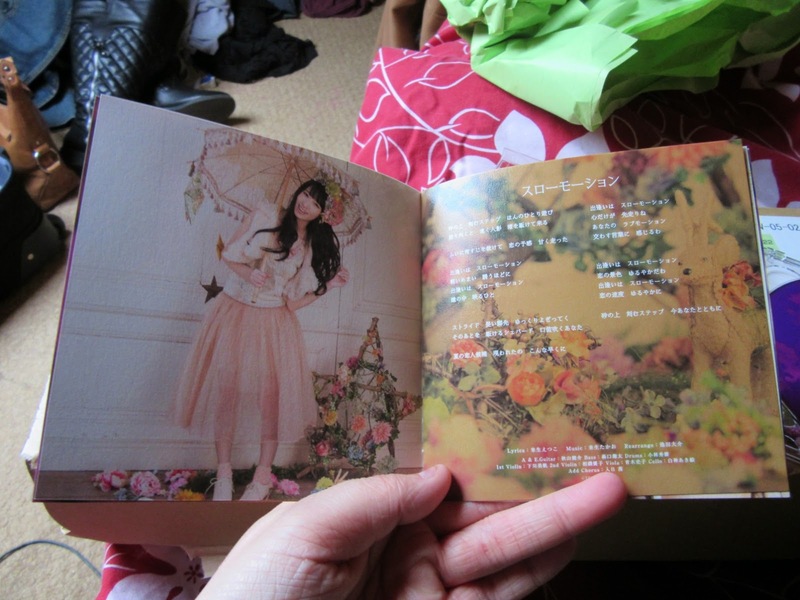 The back cover is just as pretty as the front cover, probably prettier. Her smile = radiant. 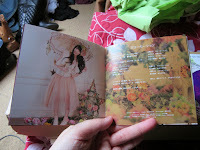 And the CD's really pretty, too; I love the floral design and then the deer that's imprinted, and the colour too. In general, I love how this single looks; it's very fairy tale-like and natural in concept, and makes me think of Yuuka as a fairy or even Mother Nature herself. Okay, so let's be honest here; this is the best lyric book I have ever seen, ever held, period. Not only does it contain five images of Yuuka, in all of her stunning glory, but it is also printed on really high quality paper. Like, it's pretty thick paper, possibly thin cardboard, but let's just say that I didn't even anticipate how amazing this lyric book would be. Like, damn. I thought that the MoMusu Updated Best lyric book was nice (and it's pretty much the only nice thing about that horrible album) because it included CU's of all the girls, but damn, this... THIS IS QUALITY, PEOPLE!!! 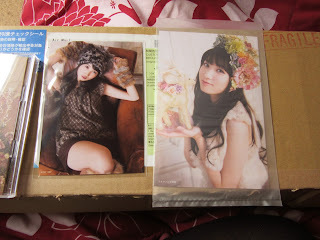 And here are the two bonus photo's I received; to the left is the first press bonus photo, which you could get in one version out of six varieties, and then the CDJapan exclusive photo - both are beautiful, though I was amazed by the sheer size hurrhurr of the CDJapan exclusive photo. Damn, that's a postcard, not a photo! But hnnnng to my first press bonus. Thank you, Idol God Koha and our Lord and Saviour, Gaki! For my next lot, I actually ordered three singles, though only two are for myself; Kimi to Mirai Tsukuritai! by Doll☆Elements was a solid given for me to buy, seeing as I adore the heck out of the A-side, and with CG's stellar debut and nostalgic sound, I was kind of smitten by them thanks to the joys of Itoshikute Gomen ne / Koi Dorobou. So of course, I bought them. With CG, I was rather lucky in the fact that I purchased one of the last few that same with a bonus photo, so Snagged GET!!! First up, good ol' D☆E! I got no bonuses with this single whatsoever, but honestly? Who cares, I'm in it for the music! This is my first purchase for D☆E, and whilst I have loved their music and style for a while (also, their PV's; holy crap their PV's), no song has struck me the way Kimi to Mirai Tsukuritai! has, so of course I bought it. The CD for this single is actually pretty simple, but very pretty, and also seems to be created in a similar style to their dresses in the PV, so a nice way to tie the theme in! It's super girly, super simple, and basically, super pretty. 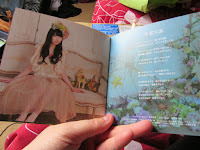 The back is cute, but also pretty simple; I like how overall, this is a very cute CD, honestly. It's not overwhelming, nor is it creative or artistic, but it's adorable regardless - effort has been made, regardless, and I am simply overjoyed by how cute the packaging is for D☆E's latest single! 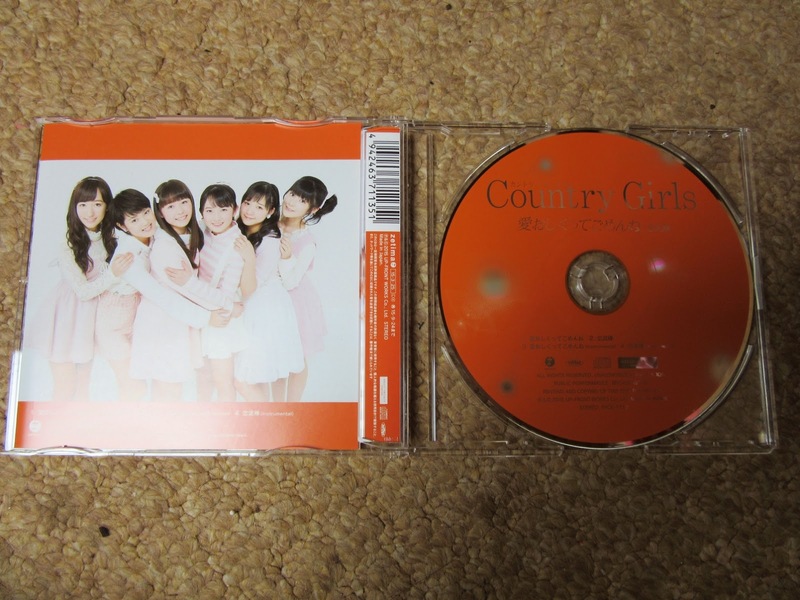 Okay, so onto the overwhelmingly cheap; I hate that H!P refuse to give their Regular A x B versions of a single a back cover, it just makes the whole package look flimsy and ugly to me. Regardless, though, that Disc is pretty as heck - I love me some violent orange in the morning, so I'm glad this was the version that I purchased. I like the cover too, though I hate how the boxes are various sizes ranging from H!P's biases to the ones they don't care much about. Still. Violent Orange CD in ma FACE! Oh, also, I received Satan herself in picture format as my bonus for purchasing this single during its first press days. I also got a poster, yet to be opened, with this single. But, yeah; Satan. Still, I'm not disappointed, because I already kind of had a feeling that I was getting Momoko, and actually, I quite like her when she isn't in Momochi mode. Despite being ranked fifth on my CG scale, I do like her. It would be a different story if I got Chisaki, though; I would have cried a lot, because I really don't care for her as a member. In no way does she appeal to me, and I would have ebay'ed that picture before you could ask which member I got. Anywhoo, here's the Regular B version of the debut CG single; I bought this version for my sister, because PINK, and also because she bought me Sayumi's last single with Morning Musume. Also... PINK!!! Seriously though, this is a pretty CD, and I am a tad jealous of it, because it is not mine. Still, though... VIOLENT ORANGE MASSACRE!!! And then the picture/trading card; my sister was quite lucky, and got the safe option that is the group photo. She actually wanted Mai (who I wanted, too, as well as Manaka's. 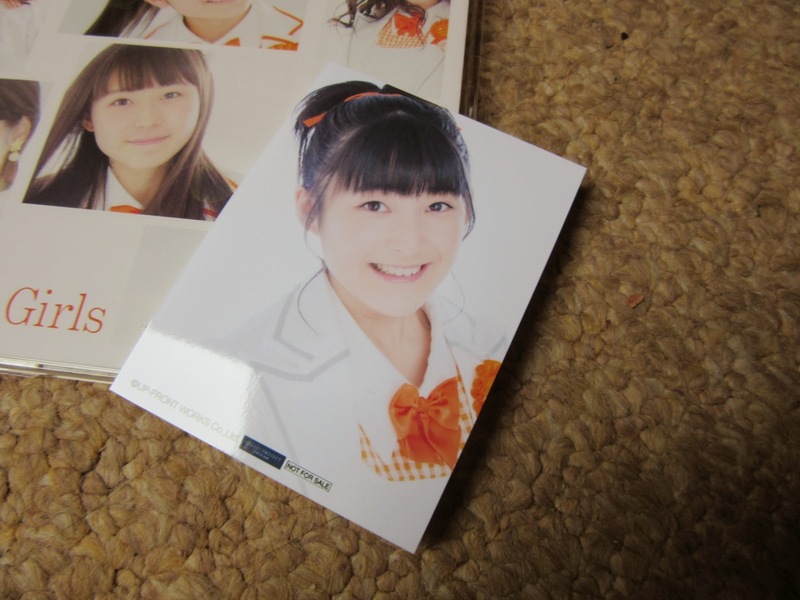 We both have a similar Oshi o-O) and noted that, if she were to get Momochi, she would cry. So, I am glad she was able to get the group image instead, otherwise I would feel bad for her! It's a cute photo, too, so again; slightly jealous. 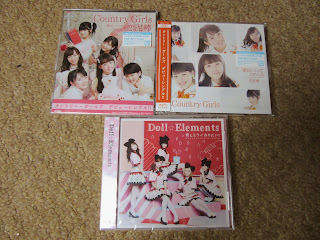 Okay, so the post didn't go as badly as I expected, and whilst writing this, I realised that my recent purchases were, of sorts, purchases of firsts for me; I never purchased these groups' releases previously, with CG's being obvious because this is their debut single, however for both Yuuka and D☆E, both of which I have followed for a while now, this happens to be the first time I have decided to buy their singles, so, yeah... a first for me, I suppose. It's nice to have this variety in my collection, though, and also to break away from buying predominantly Morning Musume or Houkago Princess singles. Honestly, though, I do like what these groups and singers have produced; of April, these songs were all my absolute favourites, and I wanted to support the artists buy purchasing what I clearly loved. If I didn't enjoy it, I wouldn't buy it, hence why you don't see Morning Musume '15's latest single in this Haulage; I won't buy things unnecessarily. For anyone who is new to purchasing Japanese singles online, I say try CDJapan out, at least once, and see if you like it or not - it won't be for everyone, but personally, I do like it. With Idol goods though, in any form, try not to go overboard on the spending - pace yourself, and get what you can afford, not what you want and think you pay for. Idol goods, singles and such are nice to have, but if you don't have the money for it, then simply don't get it - that's what I do, and when I eventually do have the money available and I don't need to purchase anything important, I typically buy the Idol CD I want, or save it for the next release. No matter what, though, remember to pace yourself and only buy when you can, otherwise you may find yourself in a bit of a pickle. I know I have, hence why I pace myself now. ... And that is my two million cents, it seems. Hopefully this was a somewhat fun post, and also, I hope that you all have a lovely day and that you take care! Happy Hauling! Until next time, please take care, and please Haul happily and with pace! Although I think you mispelled the title of this post ... shouldn't it be "H/aulage"? OK that joke is now stale and irrelevant. After reading this, I went out and immediately listened to the Yuuka Ueno song you hauled (because you have good taste). She has a great voice! I'll be putting her on my watch list. Ah, yes, H/aulag... that would be a nice nod to the memories of S/mileage and their good years, and just after that, the shittest years of their life, before they realised they needed to kill the name and reinvent themselves. Never irrelevant to look back at the embarrassing years of S/mileage. That's quite a haul and while it wasn't what you expected, it still turned out good in the end. Also, thanks for the buying advice. It'll do the newly able-to-buy fans some good. No honestly, it was what I expected, just more than that - it exceeded my expectations. I didn't mean to say it in a negative way, because really, I was already positive about my purchases - they just happened to be even better than what I thought they would be. I thought it might be helpful to add some advice, if need be, I may try and make a longer post on it. Who knows?